Patient Care Services Executive Director Sally Walton, RN, MSN, MBA, OCN, NEA-BC, is the former Program Director for the CCD floors three and four project. 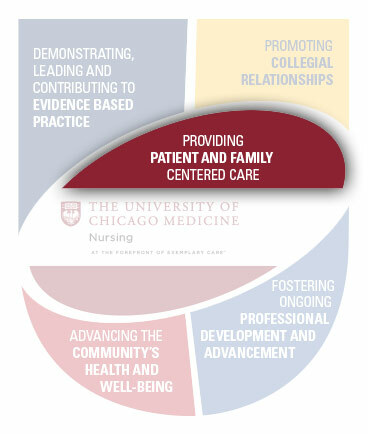 Nurses have been and continue to be at the forefront of the hospital of the future, A.K.A., the Center for Care and Discovery at the University of Chicago Medicine. From the early planning stages of the construction of the building, to when eight of 10 floors opened in February 2013, to 2016 when 156 patients were moved into floors three and four at the CCD — nurses have played an essential role. Debi Albert, Senior Vice President of Patient Care Services and Chief Nursing Officer, wore many hats, including Patient Move Commander, in the thousands of hours of careful planning and execution of the Center for Care and Discovery. She, and nurse leaders Sally Walton and Corrin Steinhauer have ensured nursing’s voice was and is ever-present in the CCD. “Collaboration across our medical center was essential. Through a meticulous interdisciplinary planning process, we played out every detail for successful move days. Nursing’s input also provided real-time insight on how we could truly build the hospital of the future and use our surroundings to deliver high quality care. We drew insights from our patients, their families and our care providers to surpass expectations,” Albert said. Debi Albert, Senior Vice President of Patient Care Services and Chief Nursing Officer, gives the go sign to launch Patient Move Day in February 2013. Patient Care Services Executive Director Sally Walton, RN, MSN, MBA, OCN, NEA-BC, is the former Program Director for the CCD floors three and four project. She was also program director and at the center of operations for the opening of the CCD at the early days of concept planning. “Being a former Hem/Onc nurse, proving a comforting, warm, quiet environment for patients was always a high priority since many patients and their families dealt with several serious health issues,” Walton said. When the hospital was being designed, she was part of a team that worked with the architect for Vision 2010, the original concept planning for the CCD. She traveled around the country to see what worked best at other hospitals and what should be incorporated into our state-of-the-art hospital. As she worked with a hospital-wide planning team to open the CCD, and subsequently build out floors three and four, she continued to draw on her 24 years of experience in bedside nursing, her specializations in technology and innovation and her work in nursing leadership. She and fellow nurses brought clarity on how to improve floors three and four for care providers, which in turn paves the way for higher levels of patient and employee satisfaction. Taking lessons learned from the patient floors that were already open, Walton, along with Corrin Steinhauer, Executive Director of Adult Inpatient Services, who was also deeply involved in the five years of planning for the opening of the CCD in 2013, examined everything from the structure and design to patient experience to workflow to take floors three and four to the next level. From caulk to software, Walton and Steinhauer were entrenched in every element of the new floors. 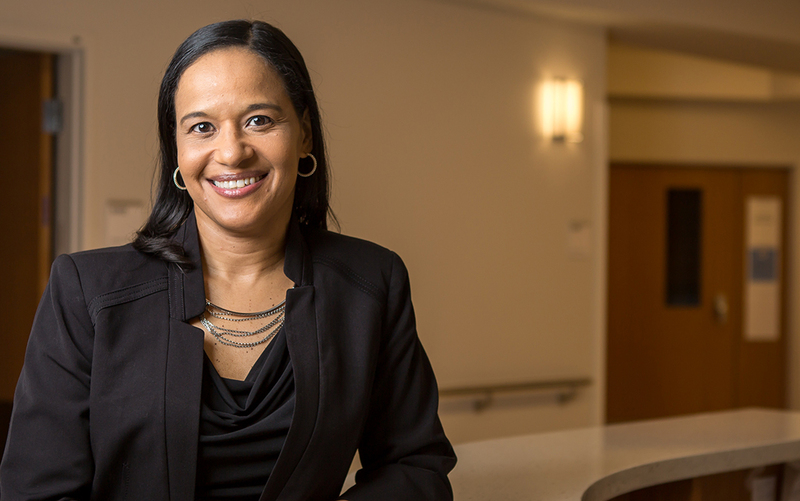 “In my role, I saw being involved in the build out and moving day process as necessary to represent nursing’s voice and to advocate for the nurses and the other professional disciplines that deliver care at the bedside,” Steinhauer said. Both floors three and four were constructed to have 98 patient beds, comprised of intensive care, medical-surgical, 24-hour observation and isolation beds. The third floor houses the burn center and acute dialysis unit. The fourth floor accommodates heart and vascular inpatient services. 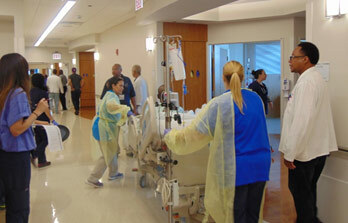 Previously, the floors were reserved as shelled space to meet increasing patient needs. Some key insights from nursing which came to fruition in floors three and four were: modifying the entrance for bathrooms in the patient rooms, reducing the number of isolation rooms to eight per floor (the remaining patient floors of the CCD have 20 isolation rooms per floor); most isolation rooms were moved to corner spaces to improve visibility for care providers. Purposeful built-in, lockable storage was placed outside each patient room, making the most needed supplies easily accessible for the staff without always needing to go to a central supply room. Dialysis boxes and ceiling lifts were built into every patient room. A dedicated procedures room was built into floor four for heart and vascular patients. Space for sleeper sofas was made for all ICU rooms. Family shower rooms and lactation rooms are on both floors three and four. Wood paneling and narrower corridors between units cast a warmer look and feel on the modern space. “The narrower corridors also help the staff to feel closer to one another,” Steinhauer said. As the floors were raised, Albert, Walton and Steinhauer worked with a tightly run strategic planning team akin to a military logistical operation, to train care providers on the new space and plan for Patient Move Day. Participants included the primary departments, such as nursing, therapy services and acute dialysis. In addition, key support departments such as Dr. CART teams, EVS, Food Service, Radiology and Patient Transportation played a role. In August 2016, more than 300 care team members from across the hospital participated in the move and served in a number of capacities from safety observers to patient transporters. 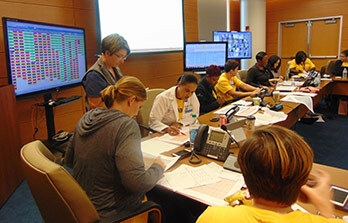 Nurse leaders at the command center, left, track and support Patient Move Day in August 2016, as floors three and four of the Center for Care and Discovery went live. Teams of nurses, therapists, techs and patient transportation carefully moved patients across the medical campus via a system of tunnels, elevators and countless turns. All 156 patients were moved successfully. Patients in the burn, ICU and multi-specialty units were relocated to the state-of-the-art rooms on the new CCD floors from Mitchell Hospital as well as other floors of the CCD. 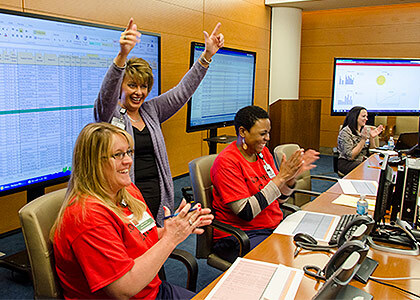 The Patient Move Day team successfully relocated 156 patients to floors three and four. Today, the units are home base for hundreds of nurses who provide integrated around-the-clock care to patients with complex needs. The patient and the family are at the core of the model to highlight they are the purpose, the reason for the work we do. Nurses incorporate the patient’s and family’s knowledge, values, beliefs and cultural backgrounds into planning and delivery of care every day.